These are some of the queries and calls for support from people within the ages of 15-26. They all speak from a common feeling of isolation and having no one to listen to. We have seen social media heat up everytime we lost a favourite celebrity to a mental health crisis. The internet becomes rife with debate. Why couldn’t the person just find help? The act was selfish and cowardly. What we end up doing everytime we participate in these discourses is we undermine the issue of mental health. All we do is perpetuate the lack of empathy and understanding around it. Half of the people suffering from a mental health issue say that the associated isolation and shame is worse than the condition itself. Imagine not wanting to wake up and start the day because you feel drained no matter how many hours you sleep. Imagine carrying a heavy weight that only bleeds self-doubt and paranoia. And then imagine not having anyone to talk to about all that you are experiencing because it would make someone feel uncomfortable, or you would very likely be told that it is “just a phase”. It will be okay, just ask for help, goes the common response. But where is the help really? 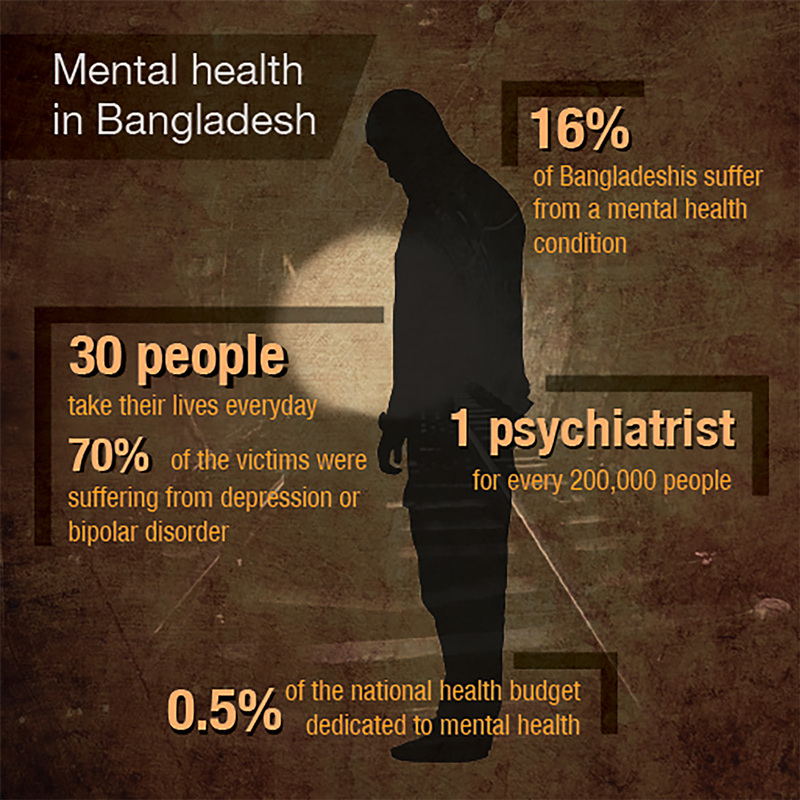 In Bangladesh, mental health is severely underfunded and under researched. Everytime, we come across the rhetoric, we are reminded of the stark gap that exists: the world saying that all you need to do is ask for help – when you’ve been asking for help and not getting it. We are fast forgetting how to listen. In our age of hyperactivity, listening with intent has become a scarce resource. Research from around the world shows that listening is one of the most powerful tools for healing, and is the first step to increasing our emotional wellbeing. It is no surprise then, that Maya Apa, the online messaging platform continues to receive queries from up to 2,000 users every day – a large number of whom are looking for support on mental health issues, with users as young as 13 years old. Kaan Pete Roi, the emotional support and suicide prevention helpline also records a largely young caller base of over 14,000. An estimated 9% of the callers here simply want to talk and have someone to listen to them. Both the platforms have fast transformed into sanctuaries to express what is denied and hidden. Many people experiencing mental health symptoms want someone to notice them and offer support. BRAC’s campaign #ThankYouForListening is urging to listen more, to reach out to someone who’s struggling. It isn’t easy seeing a friend or family member struggling with their mental health. It’s not easy to feel helpless when you don’t know what to do. But don’t underestimate just how much difference you can make, just by being there. Just by listening. *Queries collected from Maya Apa. Sameeha Suraiya is lead content strategist at BRAC Communications.